We are hyper aware of just how lucky we have been regarding Frankie’s health. But even the healthiest of kids with Down syndrome require extra care in the form of regular doctor and specialist appointments, lots of research on the part of the parents, and especially, therapy. We are so fortunate that New York City has an excellent and very comprehensive Early Intervention program and because DS is such a cut and dried diagnosis, we have met with little resistance in getting her the services she needs. 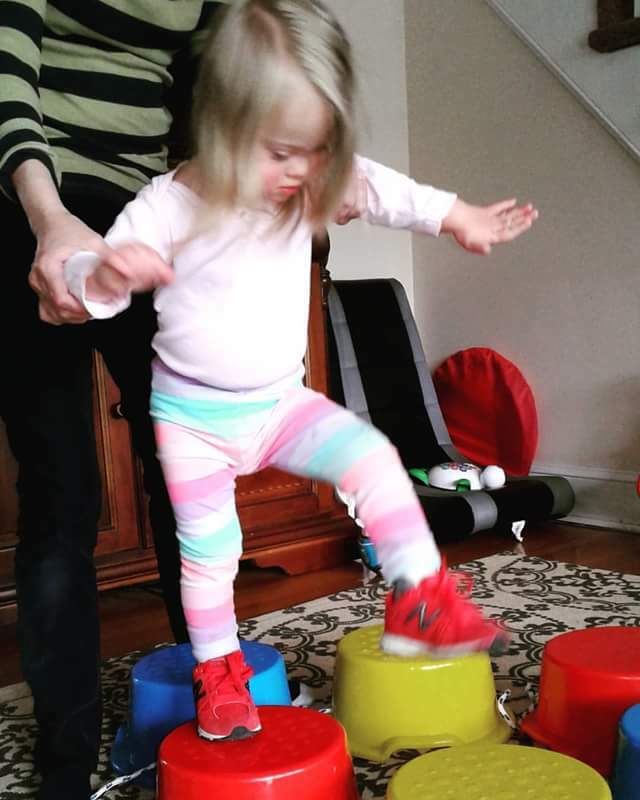 She was evaluated at 3 weeks old, began therapy at 8 weeks old and currently has 7 sessions of PT, OT and speech therapy, as well as 3 mornings in a preschool type program each week. There is tons of research to support the benefits of early intervention and Frankie has beyond flourished in the program. So you can imagine the conflict I feel when I admit that sometimes we just get burnt out. This past summer I was able to condense everything into 3 days each week so we had our Mondays and Fridays free to do what we wanted. We had playdates and went to the beach, we visited Grandma’s and we stayed up late. It was truly the best balance I’ve so far been able to achieve. She learned so much from friends and family, she built strength walking on the sand and the surf tested her balance, hugs and kisses nourished her from the inside out. Frankie will officially start full-time preschool after she turns 3. My current plan is to have her start next September and to take the summer off from therapy completely. I’m petrified I’m doing the wrong thing but I think this little girl has earned the right to be “just a kid” for just a little while. I really believe there is SO much therapuetic value in every day experiences – or else what’s all the therapy for? Besides I think this beauty can live and learn at the same time.